The latest in contemporary sink design invariably includes creative drain systems. Leading the pack in functionality and stylish design are Slot Drain Sinks. The idea of locating the drain outlet out of sight, enhances the sleek, clean, minimalist look of the sink. The first thing about slot drain sinks is the fact that the water can’t be stopped, or plugged, so if you ever have a need to “fill up the bowl”, slot drains are not the way to go. There are a lot of different styles to choose from, each with their advantages and disadvantages. Often the trough sinks made from solid surface materials such as marble,quartz or granite are constructed using flat parts, glued or seamed together, with a stainless drain system attached to the bottom. While these are functional,they involve a lot of glued parts that can collect bacteria, break down or leak over time. Once this starts, they are very difficult to properly repair. Some manufacturers will cover the slot with a long decorative stainless strainer. The biggest disadvantage we see with this system is not what you see, but whats hidden under the strip. The cleaners then, can avoid the traditionally most filthy area of the sink. What is out of site is out of mind. In a well used public washroom, it’s another moving part that can easily disappear. Some fabricators will cast a very thin, open slot along the bottom of the back wall of the sink basin. While this look is really cool, they are almost impossible to properly clean and virtually impossible to extract a ring or other jewellery which will inevitably make it’s way into the drain system. 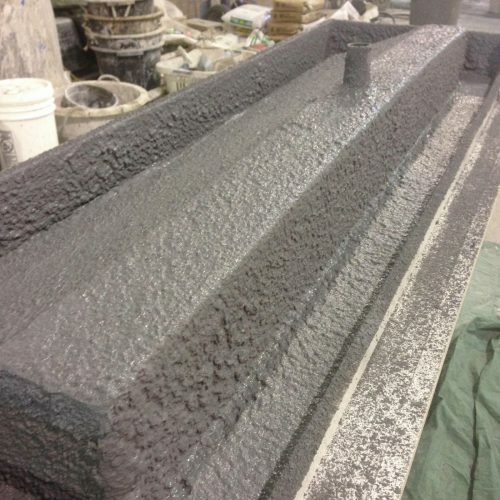 At EverGreen, our slot drain sinks are made in one piece, and the slot drain system is part of the casting. Our most popular system involves a 1″ slot that runs the length of the trough. The actual drain outlets, which can be located anywhere along the slot, are hidden along the front wall and protected by a cast-in stainless strainer. So it appears to the user, standing at the front of the sink, that there is no drain outlet at all. Other than the simplicity of it, one of the biggest advantages of this system is the ease of cleaning. A quick swipe of a cleaning brush along the trough and it’s done. If you are truly looking for something different, you should take a closer look at what we can do. 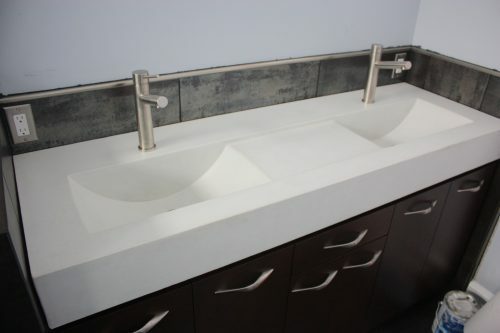 We specialize in designing and manufacturing Unique Concrete Sinks for any application, commercial or residential. Our infinite selection of colours and textures , combined with the ability to integrate our many sink styles and counter tops as one piece make each creation truly unique. Our sinks are specially designed and formed to exactly fit your space, whether it’s for an existing or new vanity or even suspended from the wall. 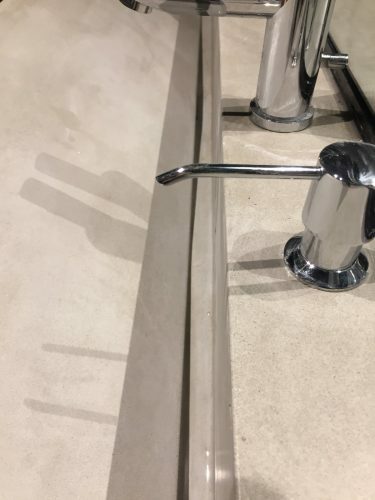 We also make custom sink shapes for unique spaces or styles.